Antoine Guedeney, MD (Paris, France) received the René Spitz Award in recognition of significant lifetime contributions to clinical practice and research studies of benefit to the infant mental health community. 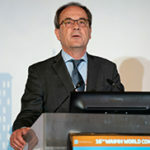 His preventive interventions for infant mental health, including the large home visiting study in Paris for vulnerable families known as the CAPEDN study, that continues interdisciplinary research for health promotion as well as prevention of psychopathology. His effective advocacy for implementation trials in other risk communities of poverty, with needs occasioned by trauma and adversity. His assessments of relational social withdrawal in infancy (also known as ADBB). These assessments are used in multiple pediatric, child psychiatric and service settings- and cross culturally validated in multiple countries, with longitudinal studies. His clinical leadership, with contributions to meaningful diagnostic classification for infants and toddlers, wherein he has conducted clinical trials and worked to revise and update useful systems, being a leader in the revision known DC:0-3 R, that in turn provided a basis for our current system now known as DC: 0-5. His editorial leadership in infant mental health, serving as inaugural and continuing innovative editor of Devenir, and then also serving as an associate editor of the Infant Mental Health Journal. His collaborative research leadership over his career involving attention to multiple levels of biological and psycho-social models of development, and to integrative theories of change for intervention research. His educational leadership regarding the importance of ethnic and cultural diversity and inclusion in communities of need—for infants and families not only in Western industrialized countries, but those elsewhere, in Africa as well as underserved countries world-wide. In this area we include his effective work within our organization, including as President of WAIMH and beyond. 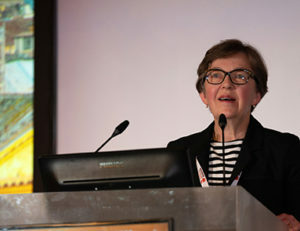 Palvi Kaukonen, MD (Tampere, Finland) received the Sonya Bemporad Award in recognition of her significant contributions to the advancement of social and public policies that benefit infants, toddlers, and their families. Dr. Pälvi Kaukonen has been for decades a chief physician in the Department of Child Psychiatry at Tampere University Hospital, Finland. Her professional activities as a clinical child psychiatrist have involved: developing child mental health assessment methods, combining research activities with child mental health service development, and clinical work in primary care and mental health services. Since 2014 she has also worked as a Consulting Officer of Health Affairs in the Finnish Ministry of Social Affairs and Health, where her role and impact in leading the national reform of child and family health care and social services has been hugely important. Pälvi was in a crucial role in organizing the WAIMH Tampere Congress already in 1996, and after the Congress she became one of the founding Board Members of the Finnish Association for Infant Mental Health in 1997. When the WAIMH Central Office moved to Tampere, Finland in 2006, Pälvi was appointed as the Associate Executive Director of the WAIMH, and then as the Executive Director in 2008. Since then Pälvi has worked in efficient and extremely successful manner in organizing 5 WAIMH World Congresses around the world with financially favorable outcomes. In addition to this, Pälvi has lead and developed the work at the WAIMH Central Office to include the WAIMH Affiliates and members around the world in a more continuous dialogue. The Sonya Bemporad Award is presented to Dr Pälvi Kaukonen for her undeniable merits in the development of clinical services for infants, and their families and for changing the whole Finnish society to a more infant friendly direction, and especially for being the heart and the soul of our organization. Lynn Priddis, PhD (Perth, Australia) received the WAIMH Award in recognition of her significant contributions to the Australian WAIMH Affiliate and infant mental health practice. Associate Professor Lynn Priddis is currently the Coordinator of the Clinical Psychology Program, and Coordinator of the Infant Mental Health Course, in the School of Arts and Humanities at Edith Cowan University, Perth, Australia. She has promoted infant mental health through her governance roles at regional and national level in Australia, and through research and training, especially infant mental health capacity building programmes in Western Australia. Lynn has been lecturing at Edith Cowan University in Perth since 1991 and has made a substantial contribution to the dissemination of scientific knowledge in the field of infant mental health. In addition to her 37 peer reviewed journal articles, she has also been an innovative practitioner researcher as evidenced by the development of the Tuned-In Parent Rating Scales (TIP-RS); a tool for intervention with targeted parent–child relationships. Lynn has also been directly engaged with infant mental health competency based workforce development and training. She and her team designed a systems change model designed to infuse the infant relationship based model into all components of the Western Australia system of care, and then to track cross unit referrals for evidence that the system of care actually functioned as a collaborative network in support of a family. This community oriented work has been conducted via international cooperation of colleagues across a number of WAIMH affiliates. 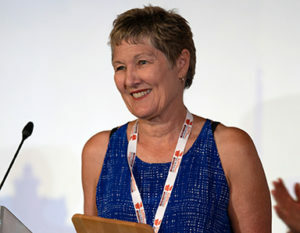 Lynn Priddis has been active in Australian WAIMH affiliate and is Member of the leadership team within The Australian Association for Infant Mental Health. The WAIMH Award is presented to Dr. Lynn Priddis for her continuing efforts to promote infant mental health programs and practices and for her clinically oriented research. 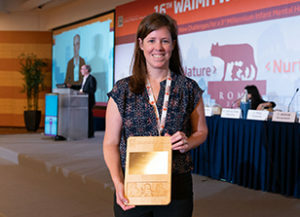 Elisabeth Conradt, PhD (Utah, USA) received the WAIMH New Investigator Award as a very promising new investigator. Elisabeth Conradt received her PhD in clinical psychology in 2011 from the University of Oregon, where she studied the psychobiological correlates of early exposure to maternal insensitivity among a group of infants raised in poverty. Her post-doctoral training at Brown University examined risk and protective factors for the development of young children exposed prenatally to opioids and other substances. Elisabeth is now an assistant professor of developmental psychology at the University of Utah, funded by two grants from the NIH to examine the epigenetic processes involved in the development of infant stress reactivity and regulation. In her work she tries to understand how early experiences become biologically embedded to impact neural, physiological, genetic, and behavioral outcomes. Already at this early stage of her career, Dr. Conradt has a very impressive publication record with papers in highly competitive journals such as Child Development, Development and Psychopathology, and Psychophysiology, among others. She is already acknowledged as an expert in the field of behavioral epigenetics: She published an invited review paper on this topic in Child Development Perspectives, and was invited to submit papers to special issues devoted to epigenetics in top-tiered journals. Her outstanding achievements have already been acknowledged by early career awards from the Society for Research in Child Development, the American Psychological Society, and the International Society for Developmental Psychobiology. Elisabeth sees great importance in wide dissemination of her research findings as evidenced by her presentations in various applied and clinical forums such as home visiting programs and a mindfulness-based intervention program for pregnant women who are addicted to opioids. She is deeply passionate about supporting the mental health needs of young children and their families, particularly infants exposed to substances in utero and those living in poverty.